Here is a fabulous church "Birthday Party for Jesus" Christmas community outreach program. Invite families with children ages 2-8 to your church or school to enjoy a breakfast that will be not only fun and entertaining, but also presents the story of Jesus. 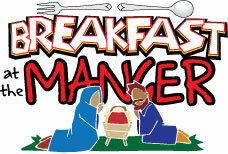 Schedule your Breakfast at the Manger on a Saturday morning a few weeks before Christmas. This Manual on CD includes all the necessary information to present a complete Breakfast at the Manger including design and decorating ideas, costuming suggestions, mean menu, puppet show, art contest, movie, birthday cake for Jesus, songs and gifts and much more. WHAT AN IDEAL WAY TO SHARE YOUR CHRISTMAS JOY WITH YOUR COMMUNITY! and the real Christmas story. Not your typical "Birthday Party for Jesus", this Christmas outreach program begins at the train station (church entry?) where riders register and pick up their tickets. When the group is ready, the conductor blows his whistle, stamps the tickets, and leads his trainload to the first stop. All abooooard stop one! Here the riders stop to hear beautiful Christmas carols sung by your church members. (10 minute stop possibly in a classroom) Visitors are given free Christmas carol books to join along and take home. All abooooard stop two! This is where the riders enjoy a tasty treat of cookies and refreshments. (15 minute stop in the church kitchen area) All abooooard to the last stop! Finally, the train pulls into the final stop (church sanctuary) where riders are seated to watch the showing of A Child Is Born, a three minute DVD (included) showing the real meaning of Christmas. With this kit, you get a complete how-to manual (on a reproducible CD), that includes wall signs, costume design ideas, ticket and name tag templates, reproducible carol songbooks, advertising suggestions, and detailed event instructions. PLUS, in addition to the kit, you receive a conductor's wooden train whistle and A Child Is Born DVD. The Birthday Party for Jesus is a great tool to share the Christmas story with the children of your church and community! The new "A Party for Jesus" program includes a complete “how to” manual on CD plus a PowerPoint Christmas story and give-away mini-booklets. Written for ages 3-8, this Birthday Party for Jesus program includes materials for up to three hours of entertainment and enjoyment. Begin with the prepared devotion and proceed with the materials. Follow a scripted manual throughout the program. REPRODUCIBLE POSTERS, NAME TAGS, ETC. Invite the children of your church and community for a fun-filled Birthday Party for Jesus! Complete "how to" manual for the Jesus Birthday Party program "It's Jesus' Birthday" includes a puppet musical CD and book. The versatility of this Birthday Party for Jesus program lets you present up to a half day of fun for the little lambs ages 3-8. Schedule it for a Saturday morning or a time of your choosing. This detailed manual on reproducible CD and animated DVD provides all the material you will need to present a joy-filled birthday party for Jesus for the children of your church and community.